Zita has discovered that intergalactic fame isn’t all she thought. Hounded day and night, she is relieved when she meets her exact clone. What could it hurt to send the clone out to pretend to be her while she plays? Unfortunately, the clone volunteers to save the Lumonians’ planet and in return they will send her home to Earth. 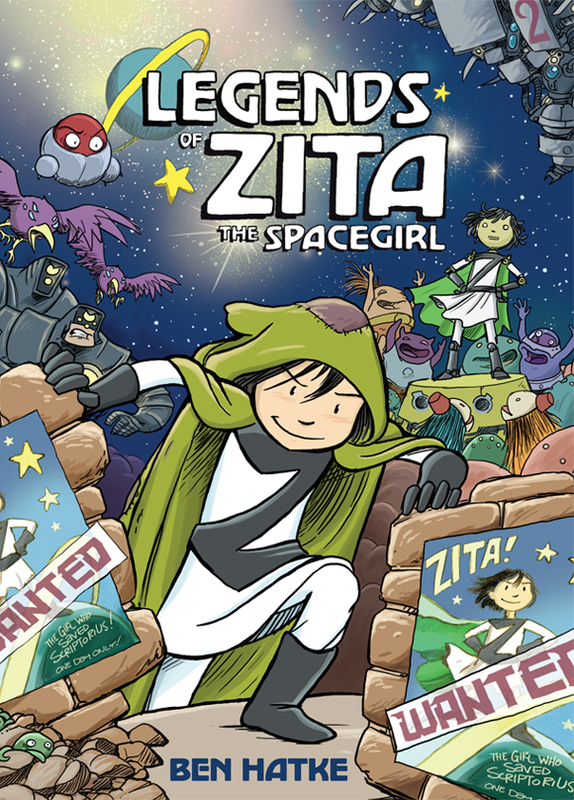 When Zita steals a spaceship to chase her down, she begins her next great adventure. Author Ben Hatke has a gift for creating action-packed scenes. You’ve got to love villains that are heart-shaped planets! The aliens are always interesting and Hatke’s sketches and guidebook entries about them show that he has carefully considered how they fit into Zita’s universe. The illustrations are gorgeous, particularly the silent shots of the spacecraft hurtling through the stars. The most powerful drawings have no dialogue but convey so much. Zita and her clone learn about heroism and sacrifice, setting the series up for a third installment. 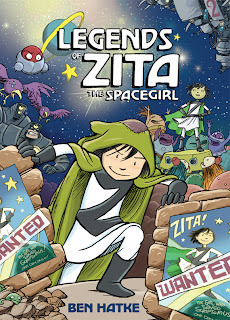 Zita the Spacegirl was the book I was rooting for when judging the Cybils and I plan on nominating Legendsof Zita the Spacegirl this year. I’m looking forward to seeing where in the universe she goes next.